Polhollick footbridge at Bridge of Cairn, Ballater, which is still closed after being damaged by Storm Frank. Council bosses are planning work to save a historic River Dee bridge which was battered by the worst flooding to hit the north-east in living memory. The B-listed Polhollick Bridge was all but destroyed when Storm Frank wreaked havoc across the region during the winter of 2015. Melting snow and incessant rain caused the Dee to burst its banks and the ensuing deluge, combined with water coming off flooded fields, caused major damage to 307 homes and 60 businesses in Ballater. Polhollick Footbridge – which dates back to 1892 and forms part of the Seven Bridges Walk – had only recently been reopened to the public in October 2015 following a £420,000 upgrade, when it was badly damaged. Now a draft timetable of works has been drawn up by the local authority, which could mean the repairs are completed before the end of the year. 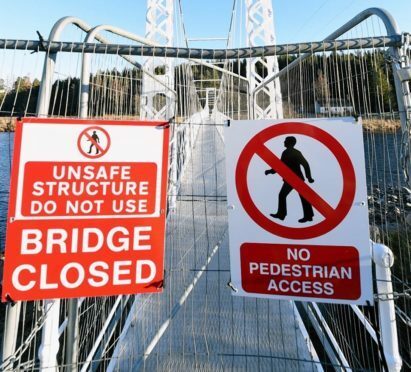 Deeside SNP councillor Geva Blackett welcomed the news and said: “Having just been at the reopening of the Bridge some weeks before, it was heartbreaking to see the damage wrought on this beautiful structure during the ravages of Storm Frank. A council document indicates that a formal listed building application should be submitted by the end of this month, with a works contract awarded two months later before repairs begins in July. It will be funded by the council and with money from the Scottish Government’s severe weather fund, although the full cost is not yet known. The Cairngorm National Park Authority (CNPA), has been involved in the process. Repairs are hoped to be completed by the middle of October. The council has, however, cautioned that the timescales are “simply indicative” and subject to change. Further downstream, more signs of recovery are also evident as the Deeside Holiday Park unveiled newly refurbished facilities in time for its 10th birthday.